Whether we like to admit it or not, we are impacted by our family. We do not live in a bubble, and our environment contributes to our personality and our habits. With my training as a Couple and Family Therapist, in the therapy process, I believe that for you to get the most effective help possible, we must look beyond your individual thoughts, and explore how other parts of your life have contributed to your presenting issue. For example, we will attempt to understand how your family functioned, what values were instilled in you, how the members of your family communicated, and how they viewed emotions and feelings. Even within one family, no two people have had the same life experience, so why make assumptions? When I refer to family of origin, I do not necessarily mean your biological parents or siblings. Our family of origin consists of the people that we identify as family, and that influenced us the most. Our family of origin can be identified as the people that we grew up with. This could mean that your family of origin could include an aunt, a family friend, an adoptive family, or a foster family. Through my experience, I have found that our problems generally do not come from a single cause. Cause and effect happens frequently throughout our life, and the reasons that we do things may have come from something that took place years ago. At times, we have pushed these things back so far that they are not easily recognized. When working through cause and effect, and while exploring family of origin, I have found individual issues may stem from a trait that has been adapted in order to survive or is something we do because that was the way it has always been done. When this is identified, we have the ability to decide whether or not this is something we want to change. Understanding the family system within family therapy can be a difficult, yet rewarding experience. Each member of any family has their own perspective of how the family operates. This is because each family member holds a different position within the family, and they all have different relationships with other family members. This is not easily recognized on it’s own. With all members present, each family member can disclose how they view their position while others listen to increase understanding. 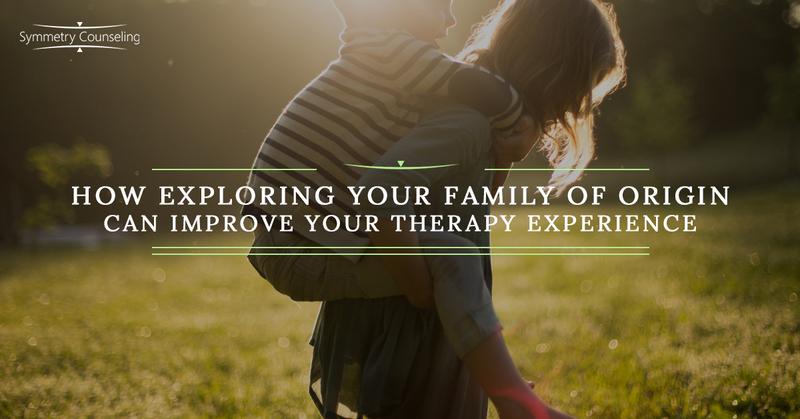 By exploring your family within family therapy, you may discover that you may need to change the way the family is operating in order for symptoms to improve. It is possible to explore each partner’s family of origin either alone with the therapist, or with their partner in the room. If partners decide to do it individually, they have the opportunity to bring back to couples therapy what was discussed and what they have discovered. However, by hearing the full story first hand, each partner may gain a clearer understanding of their partner’s background and why they do the things they do. This decision can be made based on the couple’s level of trust and vulnerability. Regardless of the approach, by exploring family of origin, couples will be able to discuss whether or not these patterns of behavior are helpful, and work together to create change within their relationship. Through each form of therapy, it is helpful for the therapist to fully understand the client by understanding where they came from. If you feel that it would be beneficial to explore your family of origin and are in need of individual, family, or couples therapy, contact Symmetry Counseling today to get matched with one of our talented clinicians!